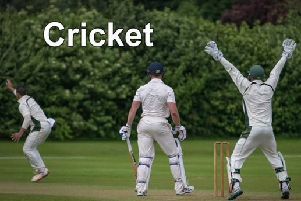 Horncastle CC ‘s Sunday side moved 39 points clear at the top of the Lincoln and District Cricket League Division Two after ending rivals Hykeham’s unbeaten start to the campaign. Something had to give as Horncastle - who had seven wins from seven contests - and Hykeham, with six victories in as many games, met. And it was the away side who kept their record in tact as they recorded a vital 164-run success. Opener Rob Bee hit a superb 131, including 16 fours and four sixes, to send out a message. An unbeaten 80 from Nathan Whiting, plus support from Jonathan Clark (17) saw Horncastle end their 40-over innings on 260-3. Hykeham were not able to match the superb batting skills of Horncastle, dismissed for 96 in the 24th over. Tom Johnson, Gareth Jones and William Broughton each claimed three wickets, with Richard Hickling taking the other scalp. On Saturday Horncastle host Keelby in the Lincolnshire County League Fourth Division, while a day later the Sunday Firsts are at home to Owmby (1.30pm).